Darling, I am NOT an ethnic nationalist! 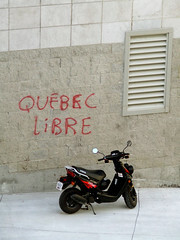 québec libre, a photo by faustineclavert on Flickr. Members of the SNP are routinely called nationalists, and the same word is often applied to everybody in the wider pro-independence movement, although Westminster Unionists also like to call us separatists, and international (mainly American) observers occasionally describe us as secessionists. Of course we’re nationalists, but civic ones, which isn’t really the primary meaning of “nationalist” in most other countries. This sometimes confuses No campaigners, who at times say things like “I can’t vote Yes because I’m an internationalist”, although most Yes people have a very international outlook. (In fact I’m often surprised by the number of people in the SNP and in Yes Scotland who have either got family abroad or have lived outwith Scotland for a long time). Of course we’re separatists, insomuch as we want to be ruled by a parliament that is separate from Westminster rather than subordinate to it, but we’re very happy to share a lot of laws and institutions with the rUK, with Europe and with the wider world. Of course we’re secessionists to a certain extent, given that it’s to be expected the rUK will be more similar to the UK than Scotland will, simply because Scotland is so small in comparison, and because most of the shared institutions are located in London. However, we tend to think of Scottish independence as putting an end to the 1707 Act of Union, which was a treaty uniting two sovereign countries, so we believe we’re dissolving a union rather than seceding from it. Sometimes I just wish people on both sides would agree to call the Yes side sovereigntists, which seems to be the preferred term in Quebec, because that’s exactly what we are. The Yes side is united by the belief that Scotland should be a sovereign nation again. “rUK” is a useful acronym. It’s less offensive than “fUK” (“former UK”) and more practical than “EWNI”. It’s a bureaucratic acronym. It’s like calling Canada and Mexico ‘rNA’ (rest of North America). No, I don’t agree — they never left North America. The useful thing about “r” is that is can mean either “rest of” or “remaining”. Anyway, what would you prefer to call the Sovereign State of the Kingdom of England Including Wales United with Northern Ireland? Wales is a principality of the Kingdom of England for state-naming purposes. Except that NI isn’t a kingdom. Anyway, while this might work from 2016 onwards, we clearly need an abbreviation that distinguishes the current UK from the UK-minus-Scotland. What would you prefer? It was part of the former Kingdom of Ireland until the Act of Union in 1800. It could revert to that status so that the UK can still be the UK. Henry VIII was the first king of England who was also King of Ireland. I like sovereignists, but I suspect it’s too positive for the Better Together folk to use. The only tool they have is negativity, once they give that up they are done. “United Kingdom of England and Northern Ireland” works well enough for me. So you can continue to call the country that’s left, the UK. Hmmm, perhaps we could learn from EU jargon. So distinguish EU before and after the various enlargements, it’s common to attach the number of member states. So the original EU was EU-6, when the UK joined (with Ireland and Denmark) it became EU-9, and it’s currently at EU-28. So we could call the current UK “UK-4” and the UK without Scotland “UK-3”. Would that work? Yes that works for me. Not that bothered about what Wales or NI might do in future. I lived in Monmouthshire (not really Wales) but I don’t have the same attachment as I do to Scotland. Personally I’m not bothered what they call themselves. It’s up to them. I’m just glad I’ll be living in an independent Scotland. Indeed, Melissa! We just need a name for the country until they come up with a name for themselves.